It’s the classic geek love story. 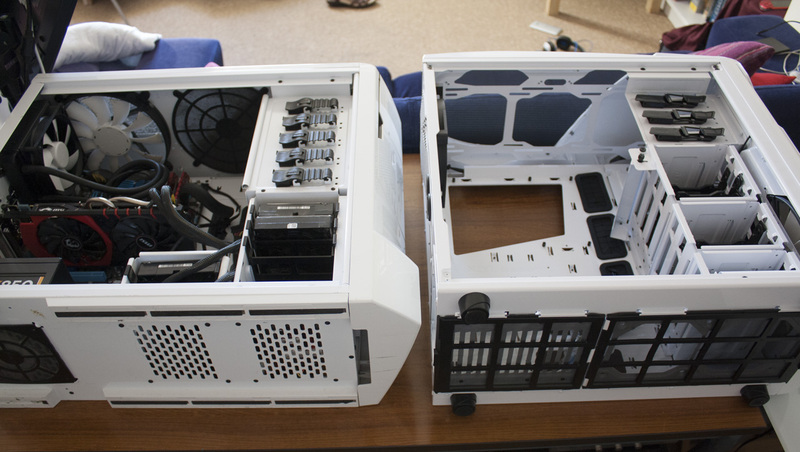 Geek meets PC case, geek shares many happy memories with PC case. One day, a new, shinier case comes along. Geek faces a decision – move onto the new model, or stick with the old love? 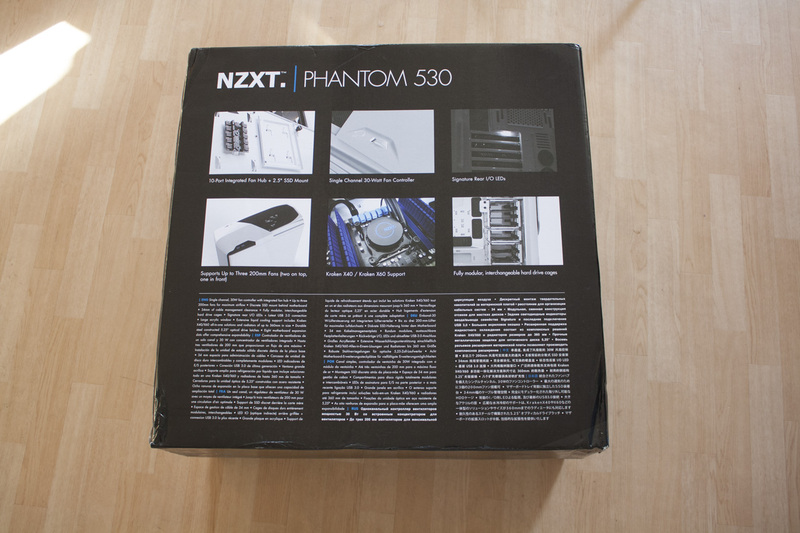 Join me for the fateful conclusion, as we examine the Phantom 530 – NZXT’s £90 modern followup to the much-loved Phantom. 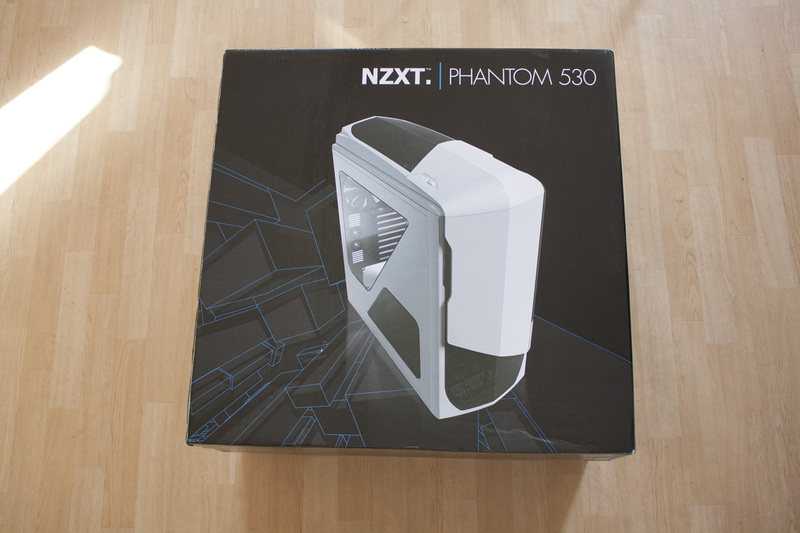 The NZXT Phantom comes in a thick black cardboard box, with the case you chose pictured prominently on the front. 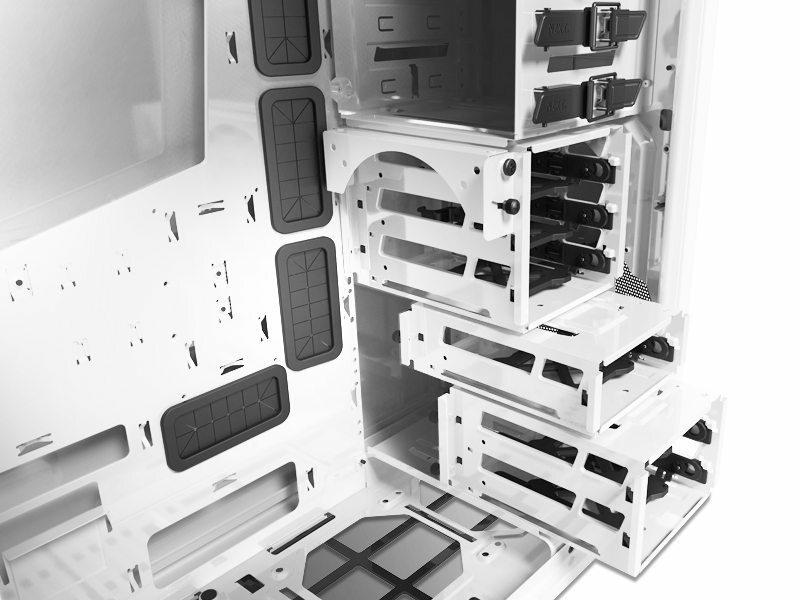 On the back we have a few special features of the case: 10 port fan hub and SSD mount, fan controller, lighting for the rear I/O panel, support for three 200mm fans + Kraken liquid cooling, plus modular hard drive cages. 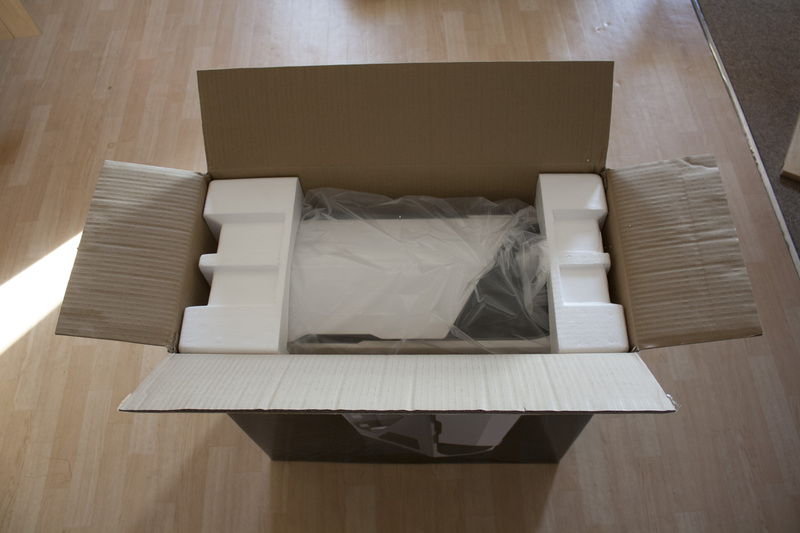 Open up the box, and we can see that the case inside is well packed in foam and a plastic bag. 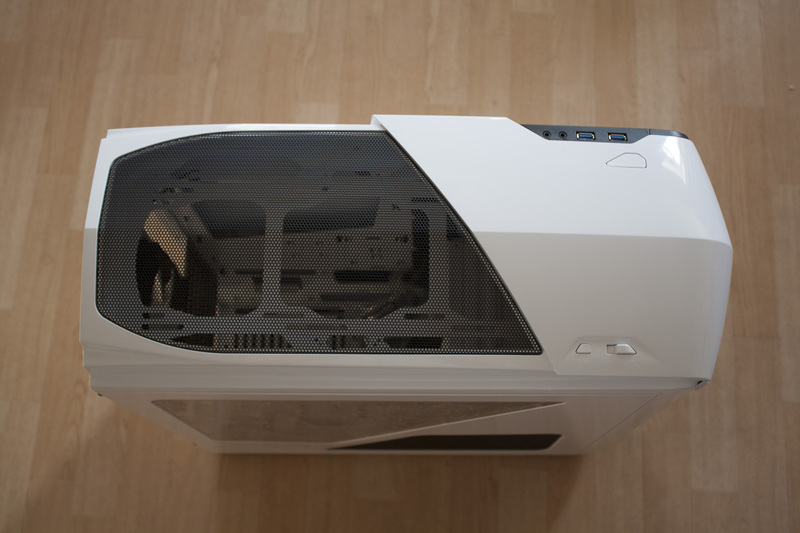 We also have some sticky plastic sheeting over the bulk of the case, preventing the case from accruing any scratches or other damage before it reaches you. An instruction manual is provided; the other components are all inside. Let’s get a better idea of this case’s design in the appropriately-titled next section. The Phantom 530 continues the Stormtrooper aesthetic of its predecessors, white and black with asymmetric diagonal lines throughout. 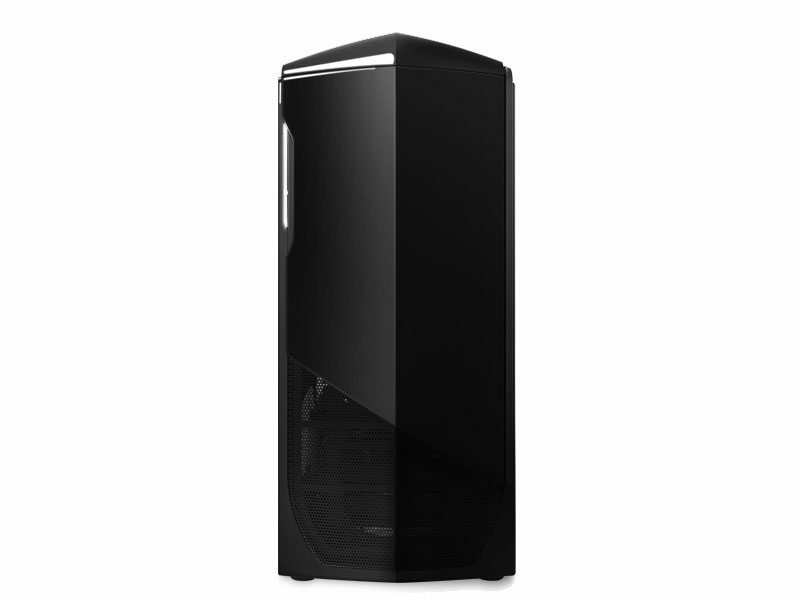 The case remains a full tower design intended for full-size ATX motherboards, although of course smaller ones can be used too. 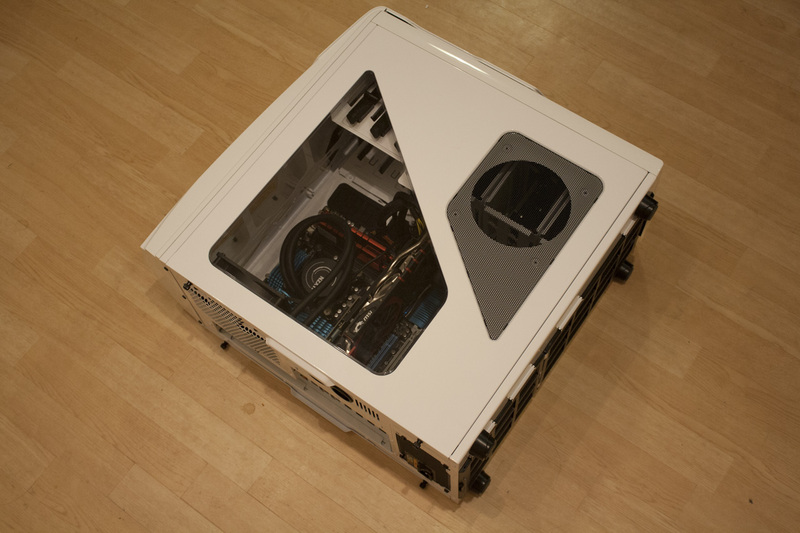 From above, you get good idea of the case – it’s tall and not perfectly rectangular. It has a noticeable prow at the top and the front. 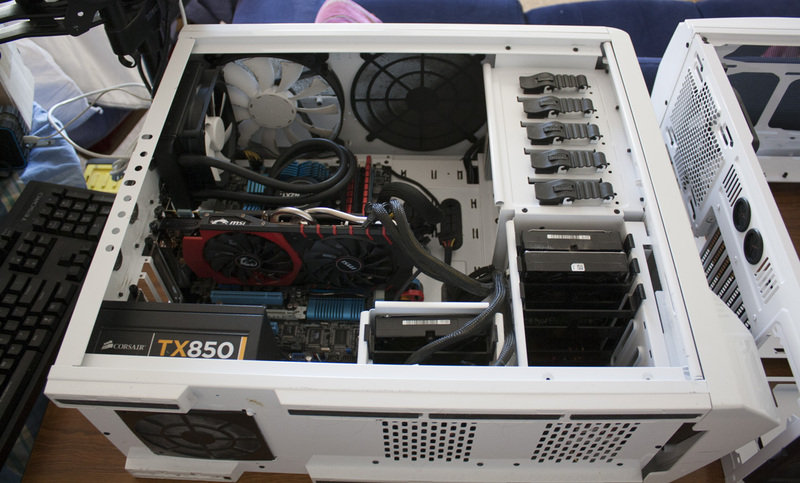 The top also contains a large upper grille with space for plenty of large 200mm fans. 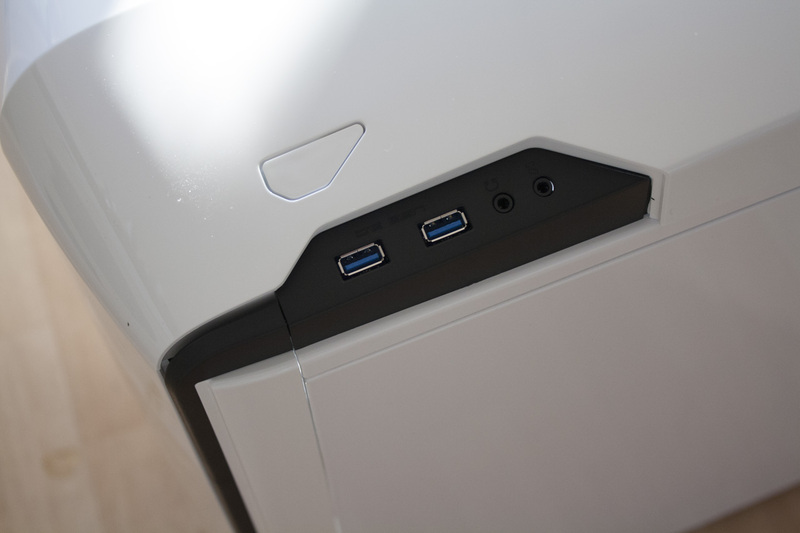 The front-right of the top of the case has a pair of USB 3.0 ports and a pair of 3.5mm ports for your peripherals. 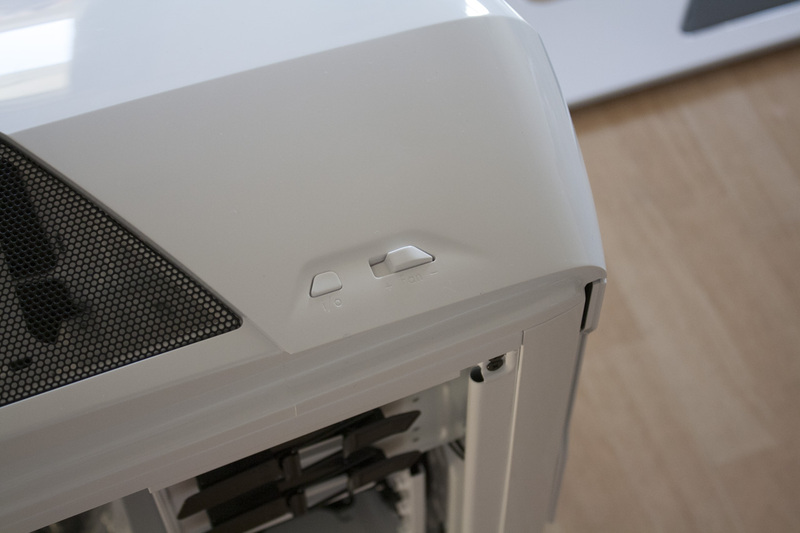 The power button is also on this side, slightly recessed to prevent accidental pushes but large enough to make it easy to find. The left side of the top has the fan speed controller and a reset button. 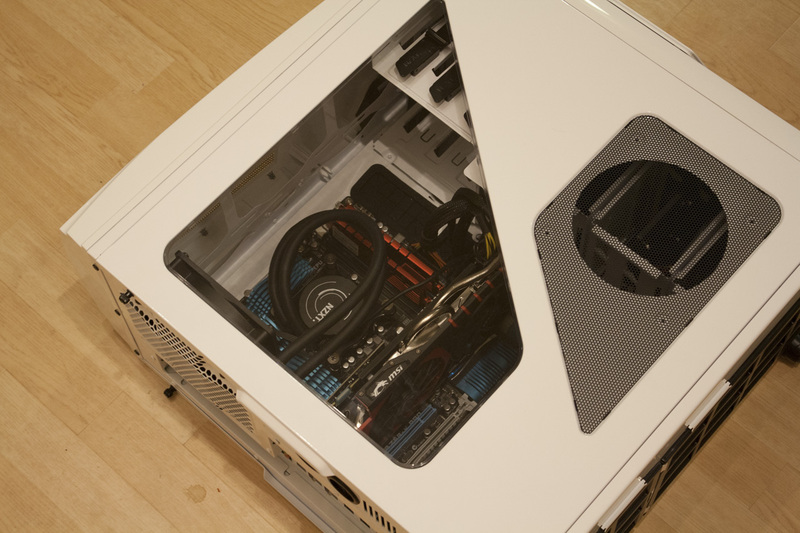 The front of the case has a door that opens to reveal three drive bays, which seems a bit overkill for most gamers. The side has a nice diagonal window on it, with the remainder of the space dominated by a large fan grille. The actual aperture is circular, but the grille is extended to match the diagonal cut of its neighbor. With the side off, we can see the back of the inside clearly. 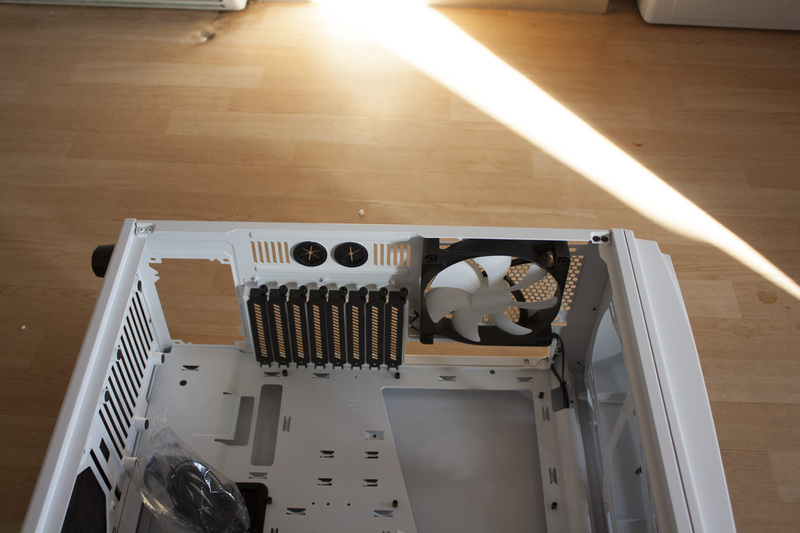 There’s a fan pre-installed here, with the normal spaces for the power supply (bottom), I/O slots (middle) and liquid cooling channels (above them). Standoffs for the motherboard are pre-installed, saving you from that particular hassle. Looking now at the other side, we have the three CD mounts, plus three hard drive cages of varying size. One can hold three drives, the next two, and the smallest one. These cages are modular; unused ones can be removed to save space, simplify construction and improve airflow. The smallest comes with a small cardboard box inside that contains extra screws and other bits and pieces, all nicely separated out. 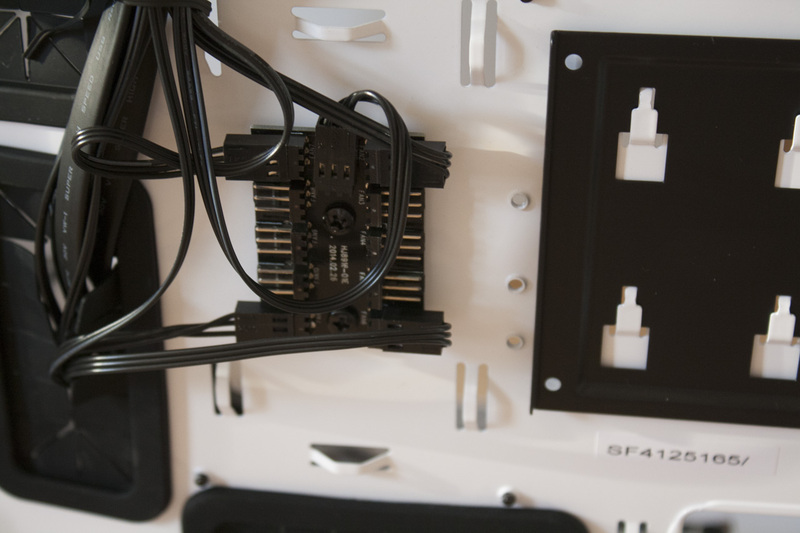 From this angle, you can also see the mounting points for the motherboard, the four passthrough points for your cabling, and the built-in cables, nicely bound and ready to be plugged into the motherboard. Now let’s turn our attention to the opposite side of the case. 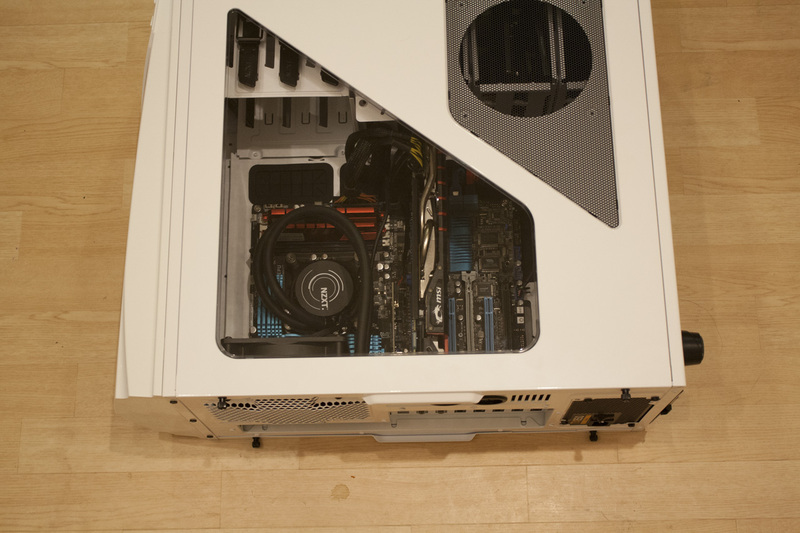 This side of the case has a good amount of space to work in, with all of the cables nicely routed out of sight. A 10 port fan controller is present as promised, and can be controlled using the slider on the top. Another unique feature of the far side is a tiny SSD clip, allowing you to remove all of the full-size hard drive cages if you’re only using a single drive. It’s also quite easy to install and remove, making it a good choice for any situations where you’re frequently swapping the primary boot drive around (e.g. in a tournament). 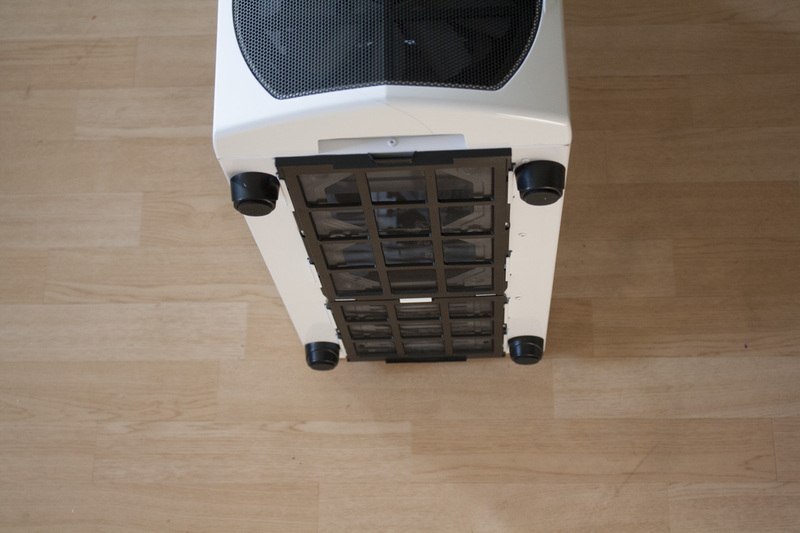 The bottom of the case includes space for fans, with a nice set of removable grilles for preventing dust ingress. 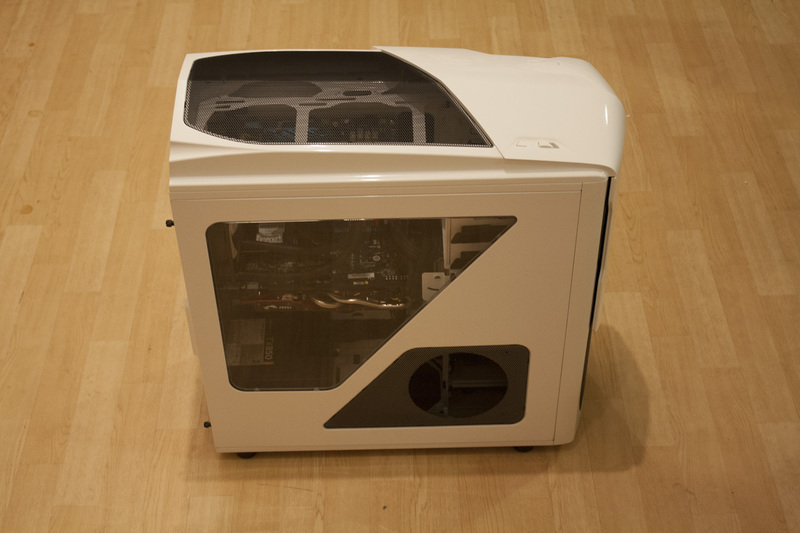 Overall, it seems to be a clean and well-featured case for its price. There are also red and black colour variants of the case available, as you can see below. I feel quite happy with my choice of white, although the red is pretty eye-catching. Now let’s move onto the fun part – installation. I expected this to be a walk in the park, but for assorted reasons (largely my own stupidity) it was more like a walk through a park that had some crocodiles lurking in some of the ponds. This section is fairly long; if you’re in a hurry I’d advise skipping to the next section – impressions. 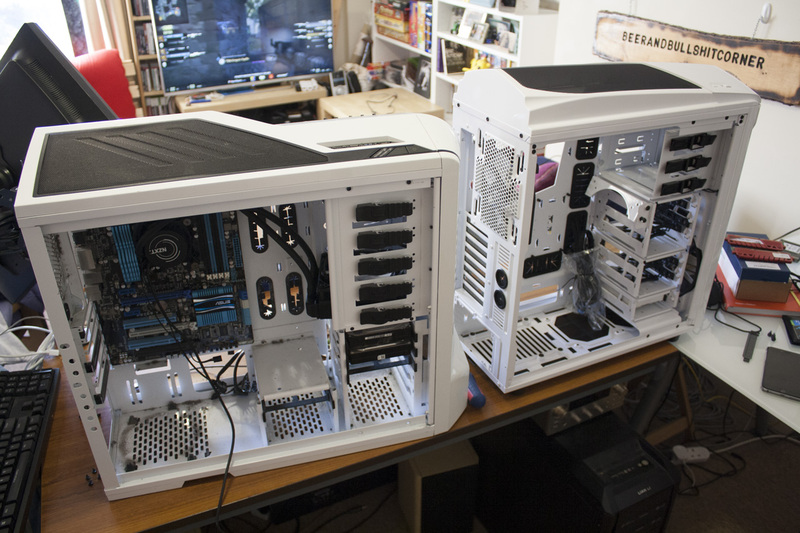 So – step one: place the old and new cases next to each other on a clean and flat surface. Consider the size of the task at hand, and reflect that you can’t play Counter-Strike until you get this sorted. Right, let’s press on. The existing installation is fairly tidy, if a little dusty. 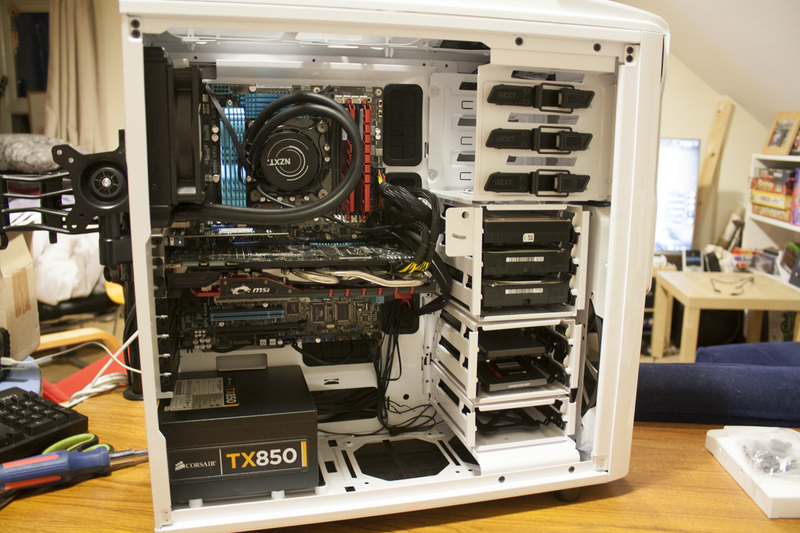 We have a single GTX 970 GPU, a liquid cooling system, two sticks of RAM, various fans and a DVD drive (which we’ll leave behind), and about six hard drives of various sizes, speeds and capacities. Step two: unplug and remove the GPU and RAM. 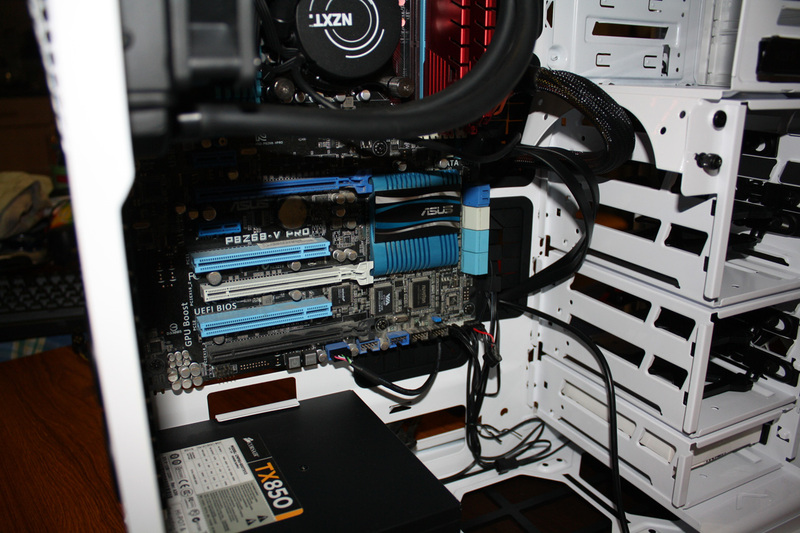 Also, unplug all of the various cables that attach to the motherboard (like power, case headers, SATA cables, etc etc. The water cooling system consists of a CPU block and a fan/radiator, which are annoyingly inseparable, so I unscrewed the fan and placed it nearby until I knew that to do with it. Finally, I took out the power supply – this can be the first thing we re-install. 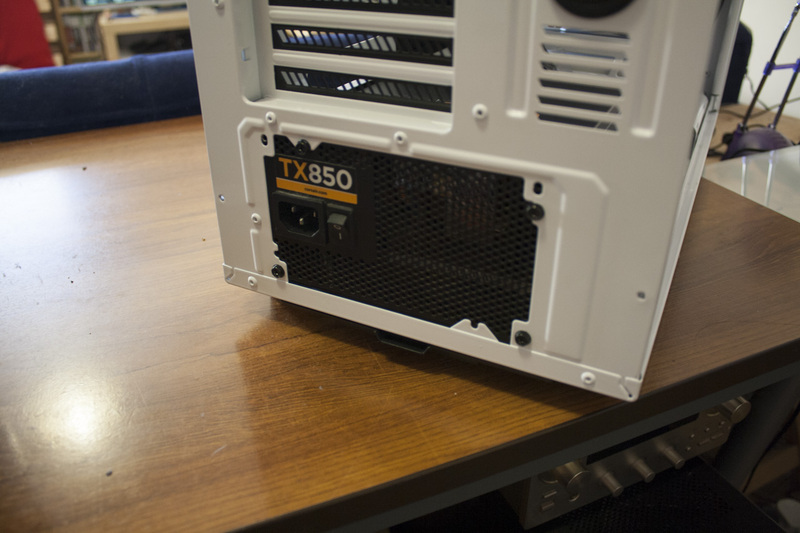 Using an assortment of screw positions, the TX850 PSU is in place in the new case. The trailing cables attached to it are passed through to the back of the case, where they get in the way until they’re plugged in much later. Now it’s time to take the motherboard out… but this is complicated by the CPU cooler, which remains attached (because I’m lazy and don’t want to remove the CPU cooler, then reinstall it and replace the thermal paste). 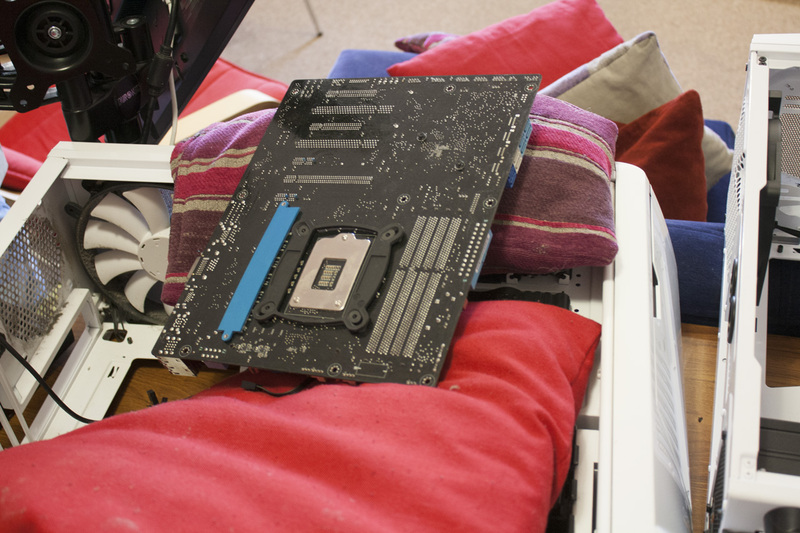 I unscrewed the motherboard from the back of the original case, then inverted it and placed it on some cushions to make sure it would stay safe while I had my hands full of other things. I managed to juggle both the motherboard and CPU cooler into the new case – an assistant would have been very helpful at this stage. 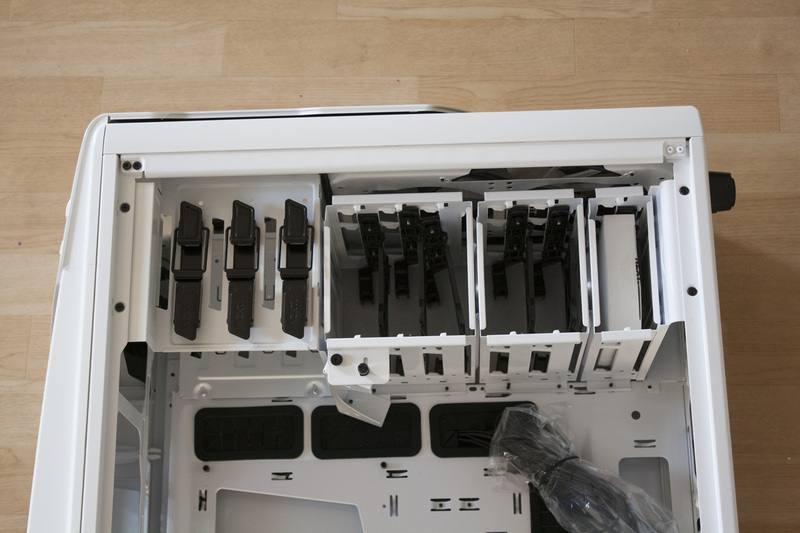 At first, the motherboard didn’t want to mount into the new case, with the same screws used in the original case just popping out when the motherboard was touched even a bit. This was compounded by my accidental removal of one of the screws for the motherboard’s heatsinks, which instantly pinged across the room when I tried to reinstall it. I spent a happy hour trying to track it down, eventually finding it under the couch cushions. I believe the motherboard was bent a bit when it was originally installed (thanks, PCSpecialist), thus causing the board to not sit well on the mounting pegs, and thereby the screws weren’t quite able to screw in enough. I worked around this by using slightly longer screws I had sitting around, thereby validating my choice to hang onto a decade’s worth of computer screws. With the motherboard in place, it was easy enough to replace the fan with the water cooling fan / radiator and install the other components. The case headers and power connector was plugged in, and the RAM installed. One minor issue was the power connector for the I/O lights and fans, a fairly standard 4 pin female molex connector. When I plugged this into its opposite, one of the cables just fell out the back. For whatever reason, that connector seemed quite badly constructed. Eventually, I was able to brace it while plugging in the male connector and thereby make the connection. 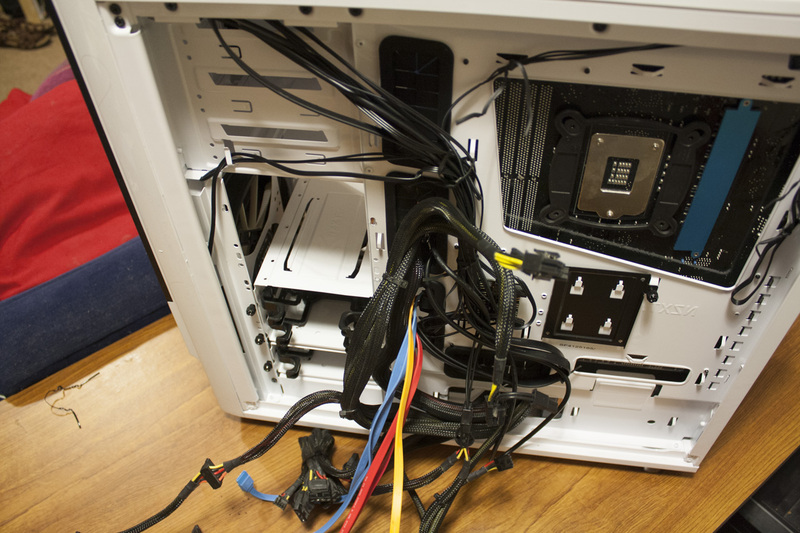 The back of the case was looking quite messy – the definite downside of a non-modular power supply, where unused cables can’t simply be removed and instead must be hidden. Now it was time to install the hard drives. I opted to place three hard drives in the largest cage, but I ended up removing the weird movable dongle (at the top of this photo, with the two black screws) as it was blocking my GPU power leads once installed. I still don’t know what it’s for. 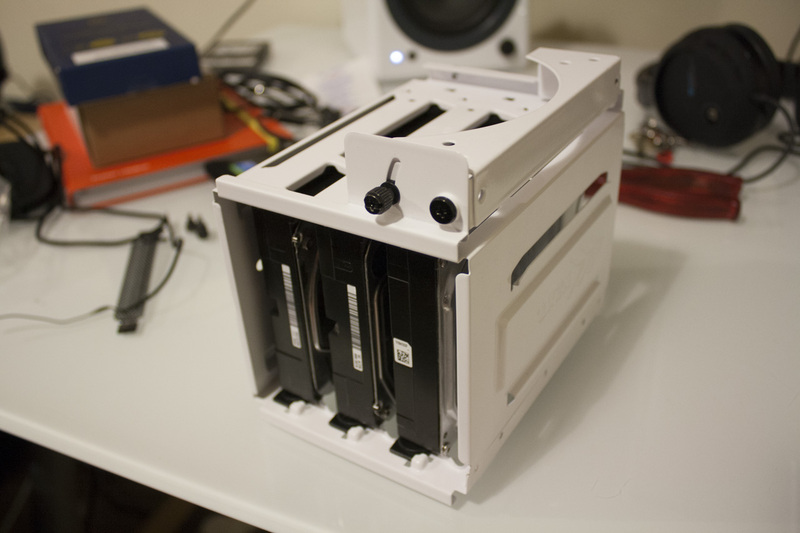 The other drives proceeded similarly, although they lacked the weird removable bit. 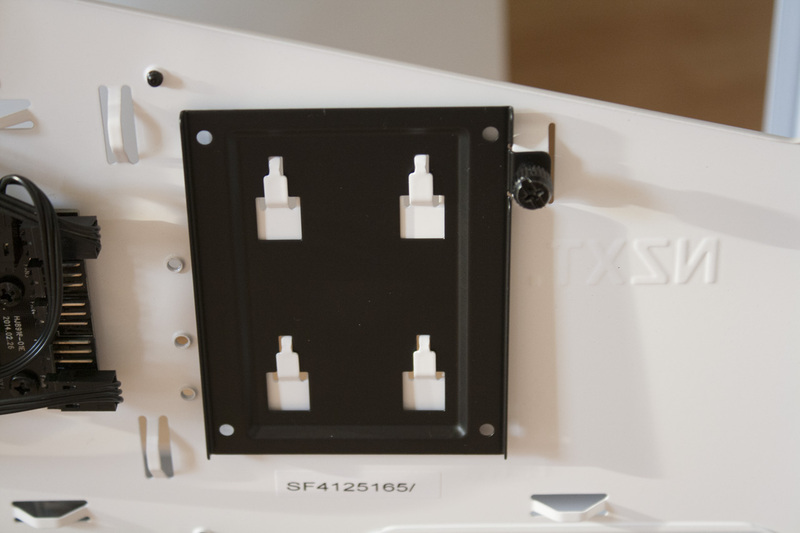 I found that the plastic mounting trays felt quite insecure, flexing as they did to allow them to be installed or removed. I prefer a clip system, which simply replaces the screws you’d normally use with bits of plastic, but of course this takes up more space. Ultimately, they did the job. Almost done now. 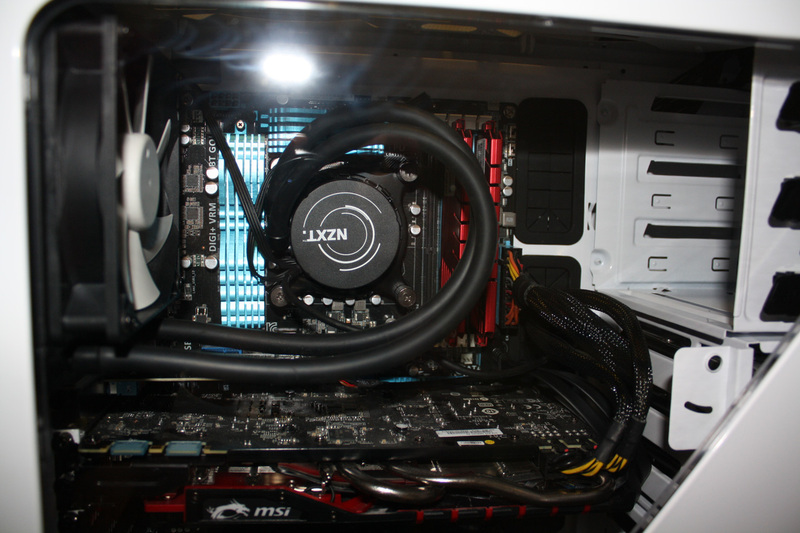 We have the GPU installed now, as well as all of the various hard drives. Can you spot the one thing I left unplugged? Here’s a hint – it’s just below and to the left of the flash in the photo below. That’s right, the auxiliary power connector for the motherboard. I completely forgot this existed, and consequently the PC turned off immediately after I started it for the first time. I spent about two hours removing and re-adding components, trying to find the problem to no avail. Eventually I was looking through the motherboard manual for the connectors to make sure they were right, and I happened to come across a page which included this connector as one of those things you definitely need to have… 30 seconds later, the connector was installed and I was in business. So remember – the auxiliary power connector is a thing that you must connect for your PC to work. Don’t be a newb like me. Excuse the poor lighting in the remaining photos – at this point it was dark, about six hours after I had begun. Still, the case looked good, and it was nice to have a windowed case to show off my handiwork in tidying away the various cables. Now I just need some bling LED lighting to really prove I’m a gamer, and I’ll be sorted! 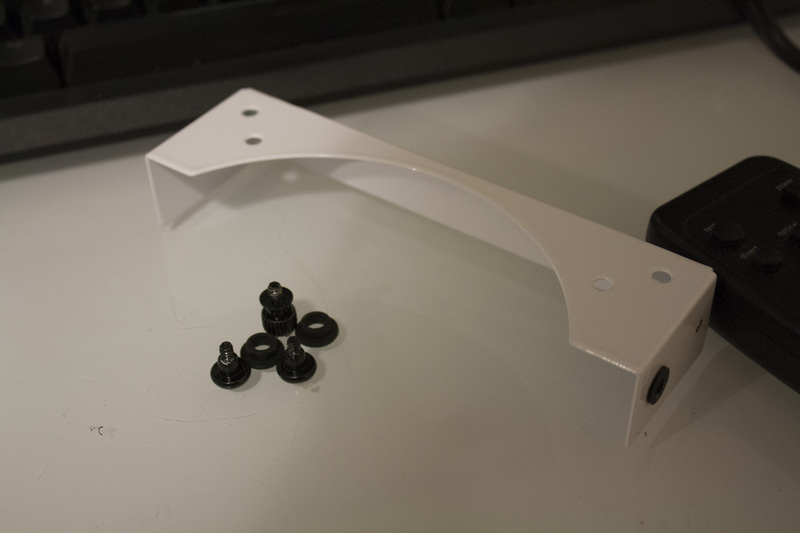 So – build log over. The process of installing my PC into this case was frustrating at times, but it was never was the Phantom 530, its design or its materials at fault – at every corner it was my own foolishness! 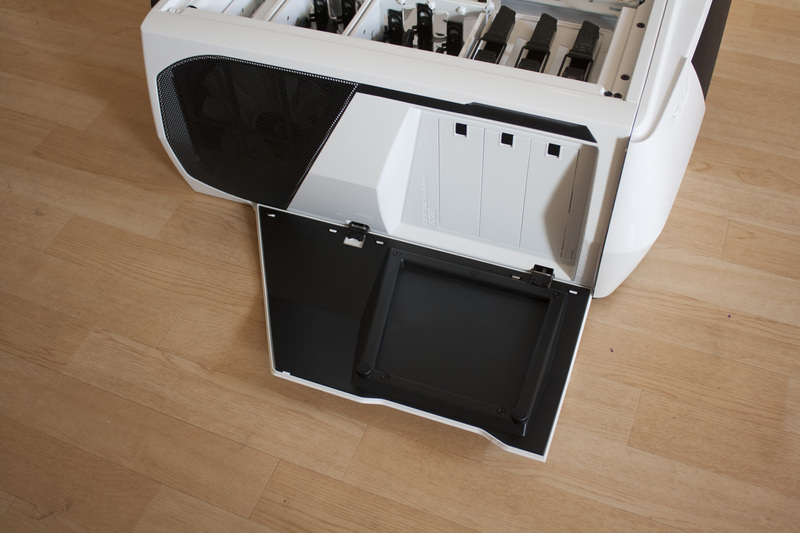 Even given these difficulties in construction, the Phantom 530 proved to be an easy-to-use case, with plenty of space to work and an intuitive design. I didn’t refer to any documentation and had an 8 year gap in building PCs, and I still ended up with a working example at the end of it. 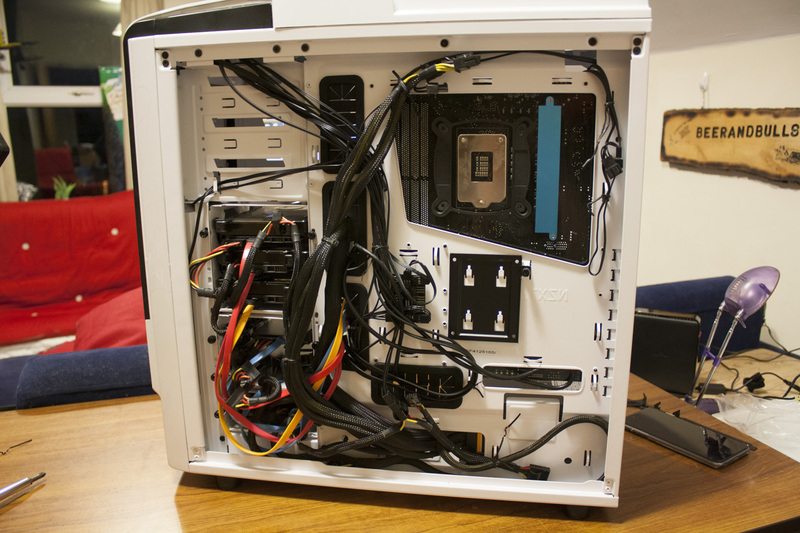 The roomy area behind the motherboard was particularly helpful, ensuring that I had the necessary platform to route cables and hide any unsightly bits and pieces. I always felt that I had to struggle to get everything to fit with the original Phantom, and things are much-improved here. The 530 also provides a good range of added features given its reasonable price. The LED for the I/O panel, the fan speed controller, the modular drive cages, the SSD mount on the back side of the motherboard: all are features I didn’t expect, and was grateful to find. 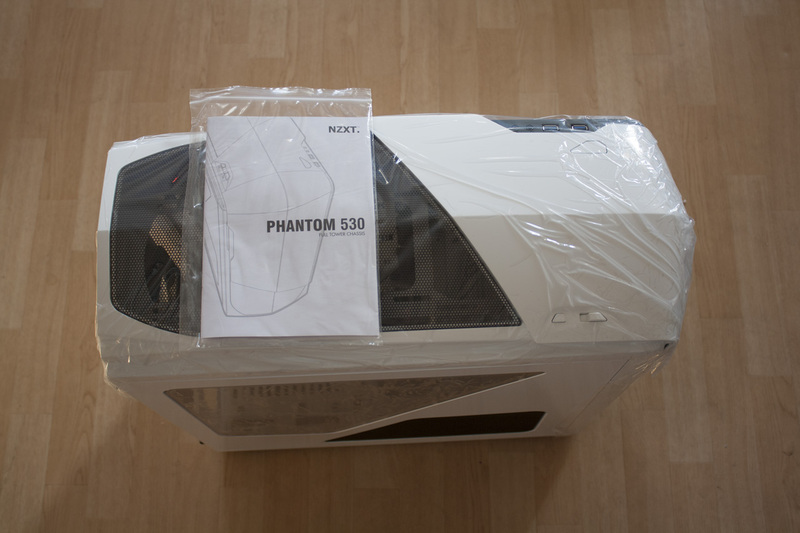 Cases have come a long way in the past five or ten years, and the Phantom 530 feels like a suitably modern case. In terms of performance, I’ve found the Phantom 530 a solid competitor. 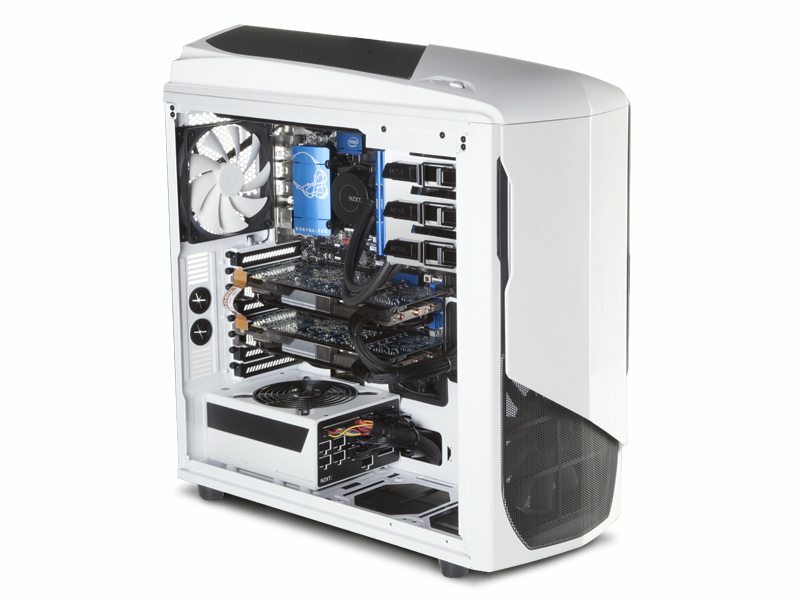 It retains the low noise and excellent thermal performance of its predecessor, particularly with a NZXT Kraken X30 liquid cooling system inside. While I lack the instrumentation to do a comprehensive analysis, you can look at the efforts of Anandtech if you’d like to see a meaningful performance comparison with a range of cases. The final component of a case for me is its appearance. The Phantom has always had a cool, distinctive look, and the 530 carries on that proud tradition. It’s a good enough luck that you could tailor the rest of your gaming peripherals around it, and I have. 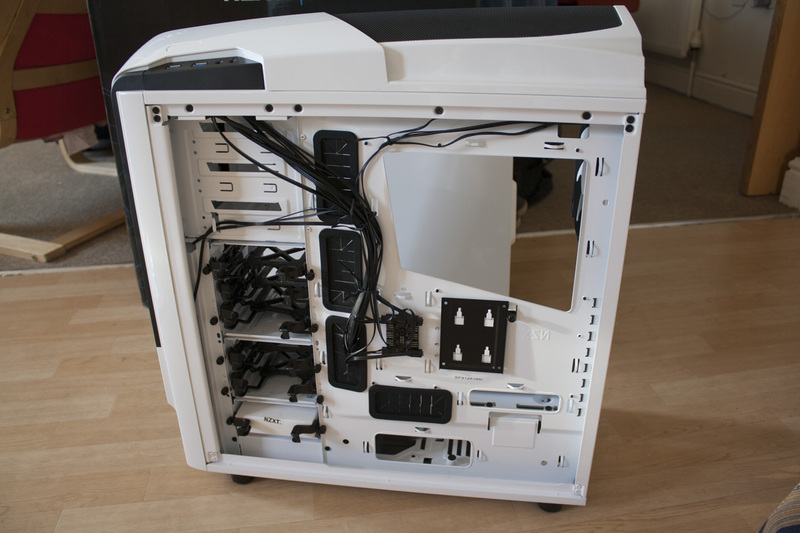 The diagonal lines and white-and-black Stormtrooper colour scheme really work, and the window ensures that you can show of your tidy cables and shiny internal components too. 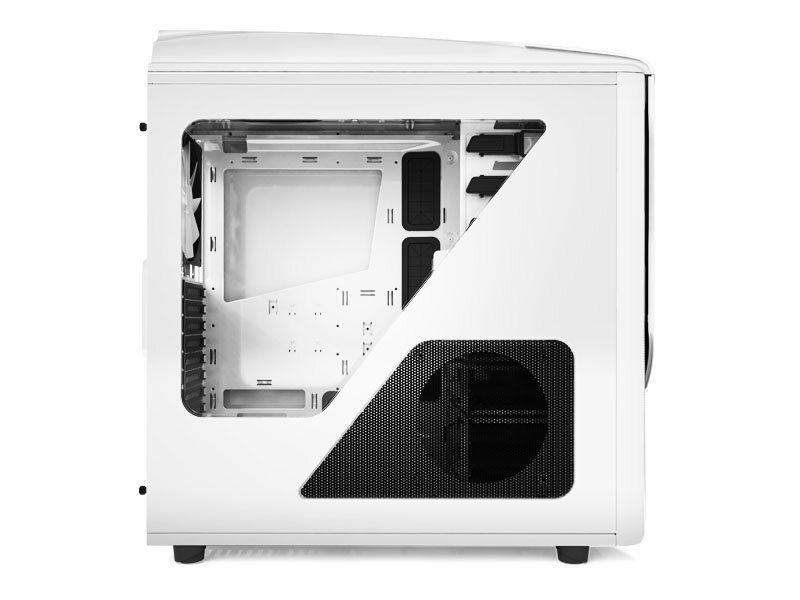 The NZXT Phantom 530 is a laudable case, combining solid performance, useful features and a distinctive look at a very competitive price point. 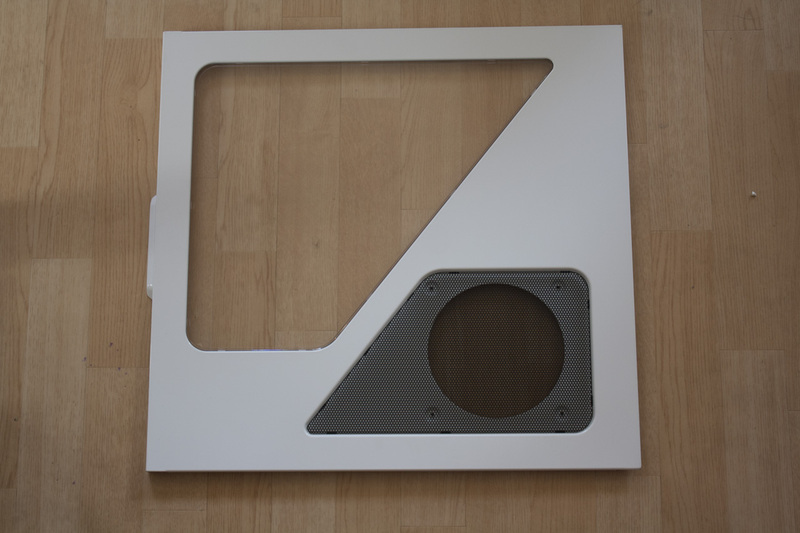 While some components could be improved, as a whole this case is almost without parallel for its cost. 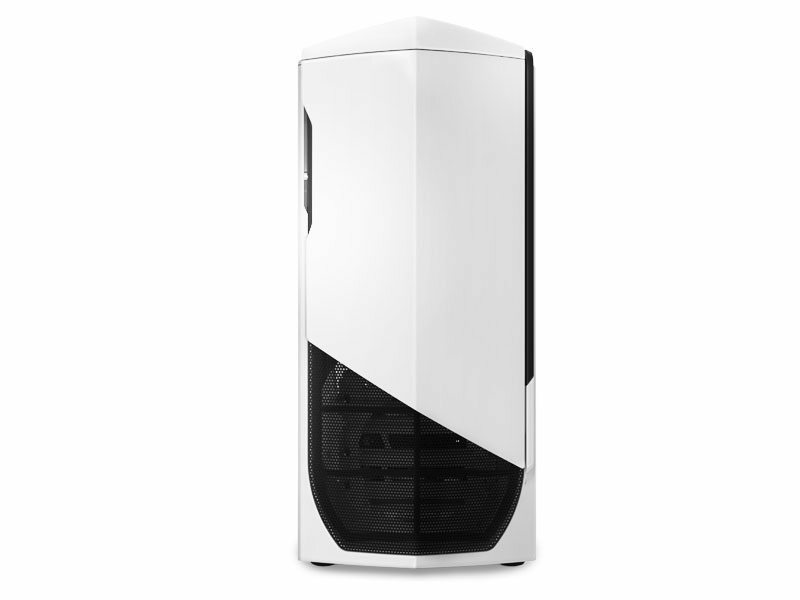 If it’s within your budget, then the Phantom 530 should be at the top of your list.